Can this budget liquid chiller compete with the big boys? There once was a time when the idea of water-cooling was seen as about as outlandish as the way we currently look at people jamming liquid nitrogen into their systems for overclocking challenges. Water-cooling also used to be rather tricksy and damned expensive to boot, but not so any more. Adding to the glut of closed-loop liquid CPU coolers is Cooler Master's latest series, the Seidon. 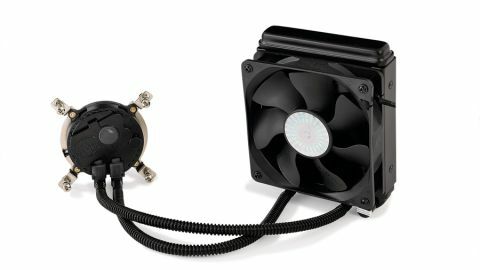 This Seidon 120M version is the single-fan setup using one 120mm fan with a radiator of the same size, much like the pricier Thermaltake Water 2.0 Performer. At less than £50 this water cooler is piling into serious air-cooling territory, and with the impressive thermal performance of even these budget liquid chillers it's getting harder and harder to recommend active air-coolers. There's another string to the Seidon 120M's bow and that's its small footprint in your PC. A £50 air-cooler is likely to have a hefty heatsink setup even before you start adding in the primary or secondary fans, and if you're not sporting some low-profile RAM, things can get tricky. With the Seidon's tiny waterblock there's no such worry, and the radiator is only around double the depth of the 120mm fan you've likely already got exhausting hot air out of the back. It also means the Seidon 120M is perfect for the burgeoning small-form factor performance PC market. With the rise in quality mini-ITX boards and chassis you also need coolers that aren't going to take up half the case. So, in practical terms, Cooler Master's Seidon 120M is a winner in the price and footprint stakes, but how does it actually perform when it comes to keeping your hot chips chilled? The answer is: rather impressively for a small radiator cooler. Our test rig uses Corsair's excellent H100; a water-cooler with a 240mm radiator and a pair of 120mm fans keeping it cool. Cooler Master's smaller Seidon 120M does a great job of keeping pace with the beefier H100. With the larger area Corsair's H100 is a more effective cooler, but that doubled radiator only manages to chill things by an extra couple of degrees at best. In fact, at stock CPU speeds, Cooler Master's latest manages to stay a little cooler under load. Though it has to be said our test H100 has taken a fair bit of punishment over the years. When we ran our 3770K at 4.6GHz the larger liquid cooler showed a bit of an edge at the high end, but still the Seidon 120M ably kept the Corsair cooler in its sights. Where the larger radiator of the H100 comes into its own is in the time it takes to get the chip from its peak temperature back down to the idle temperatures. At stock speeds the H100 does this in over 40 seconds while the Seidon takes under three minutes whether the chip is at stock speeds or overclocked. The higher performance of the cooler with the larger radiator was expected, and we also expect the Seidon 240M to be incoming very soon. But for less than £50 the performance of the smaller 120M is impressive and will keep your overclocked chips running happily.